Suede seems to be all over the high street and designer brands this coming A/W. At first I didn't think it would be me at all, but seeing as it is everywhere I have taken a huge liking to the new trend. I love the new lace up trend, which is has been roaming the recent A/W styles. This Burgundy Crop Top incorporates both the suede and lace up look, which I think it really on trend for this season. Burgundy is such a great colour for the Autumn, and I think it looks lovely on my paler skin tone. I never really shop on MissGuided but I was super impressed with a lot of their new season clothing, especially this Khaki Mini Skirt . I love the dark grey shade, as I feel it is super versatile and I could wear it in lots of different ways, The additional studded detail finishes off the skirt perfectly. In Zara they have a new page just dedicated to all things suede, which was excellent and made it so easy for me to browse. Two particular items caught my eye from the website, first the Faux Suede Bomber . I was surprised that this was £39.99 as I was expecting it to cost much more, as it looks expensive. It is a perfect jacket to be able to throw over many outfits, to help complete the overall look. I have been seeing this emerald green shade of suede everywhere, which I have been so intrigued by. The Green Leather Boots are so cute and would seriously jazz up any outfit, and is a great statement piece to have in your A/W wardrobe. I love, love, love this Suede Pinafore dresses from ASOS. I totally adore skater style dresses as they such my figure really well. I think it will be super easy to wear with different tops underneath, a pair of tights and some classic black ankle boots. ASOS had so many great places including this Embossed Croc Bag, this is actually currently sat in my saved for later basket, and is an item I keep going back to time and time again. I love the pale grey shade, and the fact that it is real leather and just £35. I really wanted to get it, and use it at university and I think I am going to have to get it. This Oversized Jacket by Pull & Bear instantly caught my eye as most of the jackets I have seen from other brands have been cropped bomber style jackets. I love how easy this would be to wear, and you could throw it over pretty much any outfit and I would look brilliant. At £99.00 it would definitely be an investment piece for me, but one worth while as it has such great detailing with the studs and big pockets. I know that this Karen Millen Pink Clutch does not belong to the traditional Autumn/ Winter colour scheme, but I think it is a perfect addition to add a little brighter colour to an outfit. I would probably use this in the evening to add a little extra dimension to my outfit. You can always rely on Topshop when it comes to statement shoes, and this season they have bot failed to impress me. These Chunky Platforms are a perfect addition to your wardrobe as you can are able to wear with lots of outfits. I love the gold detailing around the base of the shoes, adding a little more detailing. This Suedette Skater Dress is once again bang on trend with the additional lace up detailing. I love the traditional tan suede colour, and that it is also a skater style dress. I am sure I am going to pick this up at some point during Autumn, as it is a great and reliable piece to have. When I first saw this Khaki Suede Dress in Dorothy Perkins, I was not a 100% sure whether it was me or not. But I actually really like the Khaki colour, and is a great alternative to the traditional tan or black. I love the big pockets on the front and the loose style of the dress. 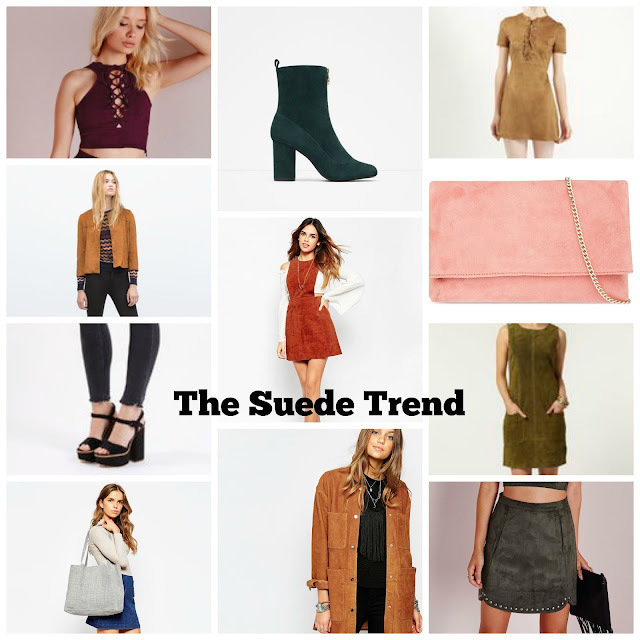 Do you like the suede trend? and have you picked any suede pieces up yet?